Huge funeral in Bnei Brak overnight for leading haredi Rabbi; crowds, congestion kills one and injures 11 others. Prominent haredi leader Rabbi Shmuel Halevi Wosner was laid to rest overnight Saturday, at a 1:30am funeral held in the central Israeli city of Bnei Brak. 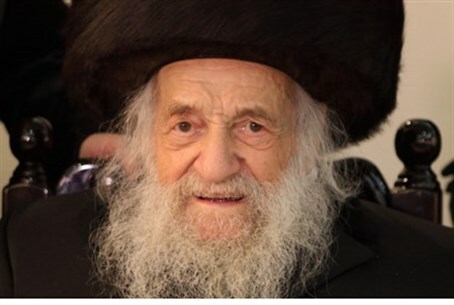 Rabbi Wosner, 102, was a leading hassidic-haredi rabbi and posek (decisor of Jewish law); he died a short time after the start of the Pesach holiday. He was known as the "Shevet HaLevi" after his major work. Mourners eulogized the Rabbi's incredible work throughout the century, which included teaching Torah and personally providing assistance to thousands. "We now accompany a century of Torah," Rabbi Chaim Wosner, Rabbi Shmuel's son, stated at the funeral. "My father dedicated his life to Torah." One rabbi told a story, explaining that one haredi Jew once approached Rabbi Shmuel with concerns that his beard would fall out due to treatments for a serious illness. Rabbi Wosner prayed for the sick man, the rabbi stated, and the man's beard stayed intact throughout the entire course of treatments. Another great rabbi noted Rabbi Wosner's love for Jewish unity. "The unity of the people of Israel was very important to him, to maintain the friendship and love in the nation," he said. The deceased's son, Rabbi Chaim Wosner (78) has been appointed as Rabbi Wosner's successor as a leader in Bnei Brak and Rosh Yeshiva (Dean) of the Chochmei Lublin Yeshiva (Torah academy) in Bnei Brak. About 100,000 people were estimated to have attended the funeral late Saturday night, and the late-night ceremony required 300 police officers to be called up for patrols and to ensure order. Magen David Adom (MDA) was called in as well, the medical group reported late Saturday night, and treated over 100 people during the funeral for overcrowding-related injuries. In one particularly severe incident, MDA teams were rushed to the scene at 1:30 am on Dessler St. near the entrance of the yeshiva in Bnei Brak, where 4 people were trampled as the funeral began. Medics provided emergency medical treatment to 12 people at the scene. One, a 27 year-old man, was in critical condition with chest and abdominal injuries; he was later pronounced dead at Tel Aviv's Ichilov hospital. A 40 year-old man suffering moderate to severe head wounds is in Beilinson hospital. Eight others were evacuated from the scene and transferred to local hospitals after suffering bruises and shortness of breath from the trampling incident. Police asked the crowd on multiple occasions to keep aware of overcrowding and basic safety rules, and urged thousands who were crowded on balconies and rooftops to descend.